Capt. 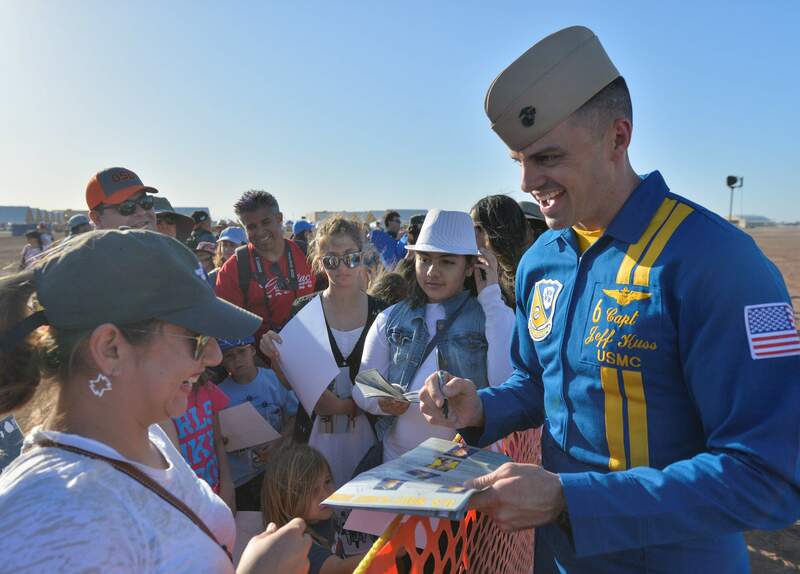 Jeff Kuss signs a handout after a demonstration during the Naval Air Facility El Centro Airshow in 2016. The Jeff Kuss Memorial Aviation Scholarship aims to send one Colorado resident through flight school each year. A scholarship has been created to honor Marine Capt. Jeff Kuss, who died a year ago on Friday in an airplane crash in Tennessee. The Jeff Kuss Memorial Aviation Scholarship, which has been organized by The Wingman Foundation, will help recipients learn how to fly by paying for flight school. The scholarship aims to help one recipient this year and do the same going forward if funding remains available. “Jeff’s passion was aviation, and my hope is this scholarship will help future generations of young people with shared goals accomplish the dream to fly,” Christina Kuss, Jeff’s wife, said. 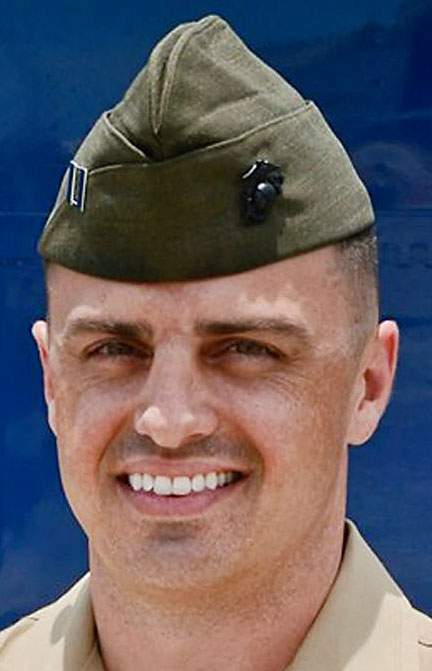 Kuss, 32, was preparing to perform in the Great Tennessee Air Show as a pilot for The Blue Angels, the U.S. Navy’s flight demonstration team, when the crash occurred. People interested in the scholarship must be Colorado residents between 16 and 25 years old at the time of application. Applicants younger than 18 must have consent of a parent or legal guardian. If candidates are in school, they’ll have to maintain a GPA of at least 3.0. The scholarship is intended for applicants with little to no experience in aviation. The deadline for a completed application is March 31, 2018, and the recipient will undergo flight training in the summer of 2018. The Wingman Foundation is a nonprofit dedicated to honoring fallen veterans of the Navy and Marine Corps aviation community and providing support to their families. Michael Rogers, program director for the organization, reached out to Christina Kuss to provide support immediately after the crash. “We just really want to honor who Jeff was and retell his story and hopefully be able to reward someone who has worked hard and give that person the opportunity that Jeff had,” Rogers said. Rogers called Christina Kuss after things had quieted down, and the pair began to brainstorm a way to honor Jeff Kuss’ memory. After some deliberation, Christina Kuss decided she wanted something that included Jeff’s passion for flying. “Allowing another young person the chance to fly is something I know Jeff would love to pay forward with his sacrifice,” Christina Kuss said. This will be the fourth scholarship The Wingman Foundation will offer. All of The Wingman Foundation’s scholarships are created to honor their namesake and inspire recipients to learn more about them. The combination of allowing a young adult to explore and learn something new about the world, and creating an opportunity to help Jeff’s legacy live on, was an amazing opportunity, said Harry Roberts, scholarship director for the Wingman Foundation. The scholarship is the third created to honor Jeff Kuss. The Jeff Kuss Memorial Scholarship, through the Fort Lewis College Foundation, was created to help veterans get their degrees. The Captain Jeff “Kooch” Kuss Memorial Scholarship will benefit the children of fallen Marines or Navy corpsmen and was established by the Marine Crops Scholarship Foundation. In addition, the foundation has pledged up to $30,000 in scholarship funding to Kuss’ children, Calvin and Sloane, once they reach college age. For more information about the Jeff Kuss Memorial Aviation Scholarship, visit www.wingmanfoundation.org/kussscholarship.